Use clean scissors to snip the marshmallows in half diagonally. 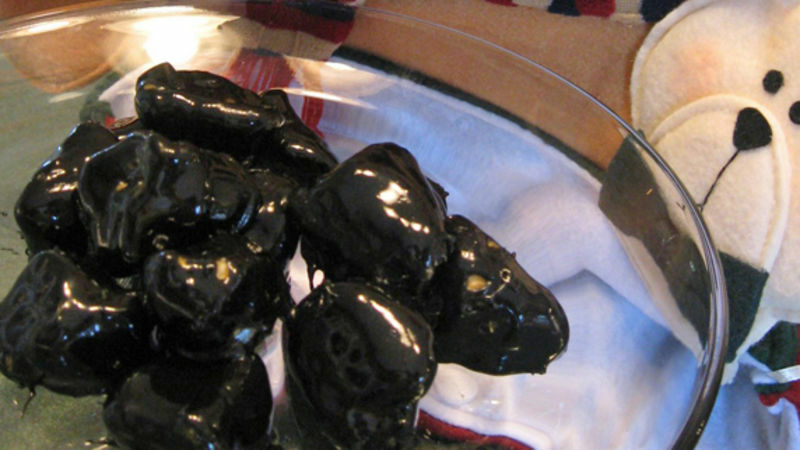 Put caramel candies in a glass bowl and microwave for 45 seconds. Add a 1-2 tablespoons milk to help thin out the caramel. Stir, microwave at 20 second intervals until melted. Using a toothpick or fork, dip the marshmallows in caramel, shake off excess, and place on wax paper to harden. Put icing in a bowl and microwave 45 seconds, until melted. Stir in a few drops black food coloring. Take caramel marshmallows and dip in icing. Set on wax paper to harden (about 10 minutes). Serve to everyone on your naughty list!